Scientists have a relatively good understanding of the processes occurring in the upper portions of Earth's crust that lead to volcanic activity. However, much remains unknown about how these shallow processes are controlled by the large-scale tectonics and deep mantle processes that are ultimately responsible for volcanism. A NSF-funded group led by DTM seismologist Diana Roman headed to Alaska for three weeks, two of which were spent on the research vessel Maritime Maid, to collect seismic data in the Islands of the Four Mountains and tephra samples throughout the eastern Aleutians. The group included Roman and DTM postdoc Amanda Lough, as well as Dan Rasmussen, Alex Lloyd, and Terry Plank from Columbia University's Lamont-Doherty Earthy Observatory, Pete Stelling from Western Washington University, and John Power, John Lyons, Christoph Kern, and Cindy Werner from the U.S. Geological Survey. The goal of their work is to determine how the amount of water dissolved in magma affects where, and for how long, magma is stored in Earth's crust. This information is critical for accurately forecasting volcanic eruptions and understanding the large-scale porcesses that lead to volcanism in Earth's subduction zones. The volcanoes targeted in this study have a wide range of magma water contents, magma storage depths, and depths of seismic activity, making them ideal candidates for this research. 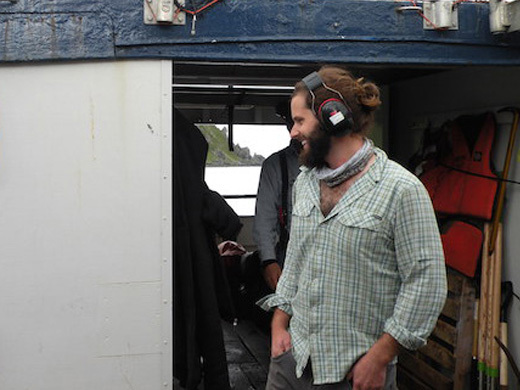 Roman will be leading another trip next summer to retrieve seismic equipment from the Islands of the Four Mountains. Photos by Diana Roman and Amanda Lough. 23 November 2015.